Man, it's hard for me to come here to post lately. I can't even claim insane busy-ness...or a family tragedy...or anything remotely close to anything earth-rocking. So where have I been? Well, I find when I'm online, I immediately go to Pinterest. I pull up to my boards, take a seat, get comfy, and I don't seem to move for ages. Seriously, I'm addicted. So if you're missing me here (ha! ), then do head over there and say hi! But I've finally broken free for a bit to stop by and share this gorgeous recipe with you: Cannellini Beans with Rosemary, Thyme, and Lavender. Cannellini beans are one of my favorites: they're creamy, rich, and ridiculously versatile. I love that you can mash them up with roasted garlic and olive oil and - bingo! - you have a satisfying crostini topping. White beans with bacon? Sublime. White beans with thyme? Perfect pairing. A little sprinkling of crushed red pepper? Even better. In a soup? Of course. Pureed? Yep. I've even been known to eat them with breakfast. I'm beginning to sound like Bubba in Forrest Gump, aren't I? And the best thing? For me? Is that they come in a can! I know purists and cooks more advanced (or snobby) than I am will sniff at how easy it is to soak dried beans overnight, etc, and blah, blah. But, you know, some things are just quicker from a can. Easy as that. If I can take this shortcut, then I'm taking it. There are many, many other places where I don't cut corners when I'm cooking; opening a can of cannellini beans is practically a gift to myself. I thought I'd tried damn-near every preparation - it seemed that way - so I was particularly excited when I read this one in one of my new favorite cookbooks, The Improvisational Cook by Sally Schneider. 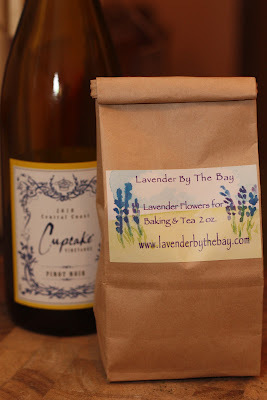 I have to confess that I've never used lavender in a recipe before so I was completely intrigued. Sally Schneider has a note before the recipe that has some serving suggestions: "[these beans] make a fine little meal on their own, with some shavings of Parmigiano, aged goat cheese, or ricotta salata [...] They are also a classic accompaniment to grilled or roasted lamb." I'm not a big lamb fan so we just served the beans on their own, but feel free to give the pairing a try yourself! And - bonus! - this is a one-pan recipe! 1. Combine olive oil and shallots in a large (12-inch) heavy skillet. Cook, covered, over moderate heat until the shallots are soft and golden, about 5 minutes. 2. Stir in rosemary, thyme, and a pinch of dried lavender (note: careful on that pinch - lavender is very potent!). Saute, stirring, for 1 minute. 3. Add beans and 1/3 cup water to the pan. Bring to a simmer, reduce the heat to low and cook, stirring frequently, until the liquid has almost evaporated, about 5 minutes. Add lemon juice. Adjust the seasoning, adding salt and pepper as needed. Spoon the beans into 4 bowls. Drizzle extra virgin olive oil over each serving. If desired, serve with grilled baguette slices. LAVENDER NOTE: Dried lavender wasn't easy to find. I ultimately found it at the Union Square Greenmarket. You can order it online at Lavender By The Bay (the same sellers at Union Square). WINE NOTE: I paired this with the Cupcake Pinot Noir, which you can get at Trader Joe's. The beans brought out all the berry in the Pinot Noir - very nice. NOTE ON KID-FRIENDLINESS: I know, I know. I haven't made many kid-friendly meals lately. This was served on an "Adult Dinner"night after Bug had gone to bed. She won't touch cannellini beans. Eat, drink, and look for new ways to dress up old favorites. yum!!! i loves me the cannellini too. no way would my meat-loving boy stand for this as a main dish, but i will make it when he's out of town!